← Like Stuff Adults Write. But Funnier. We’ve all seen these DIRECTV commercials featuring “Gregor” the Russian billionaire. In fact, even 7-year-old boys without cable have watched these ads. Gregor? Igor? It’s not important. What is important is that the television viewing dreams of grateful young Americans are being realized thanks to fictional Russian billionaires. And Gabriel: Opulence, you has it. (Check out Shelly’s personal training site at www.pacpersonaltraining.com! Posted on May 4, 2011, in Thank You Notes and tagged DIRECTV, Petite lap giraffes, Stuffkidswrite.com. Bookmark the permalink. 8 Comments. 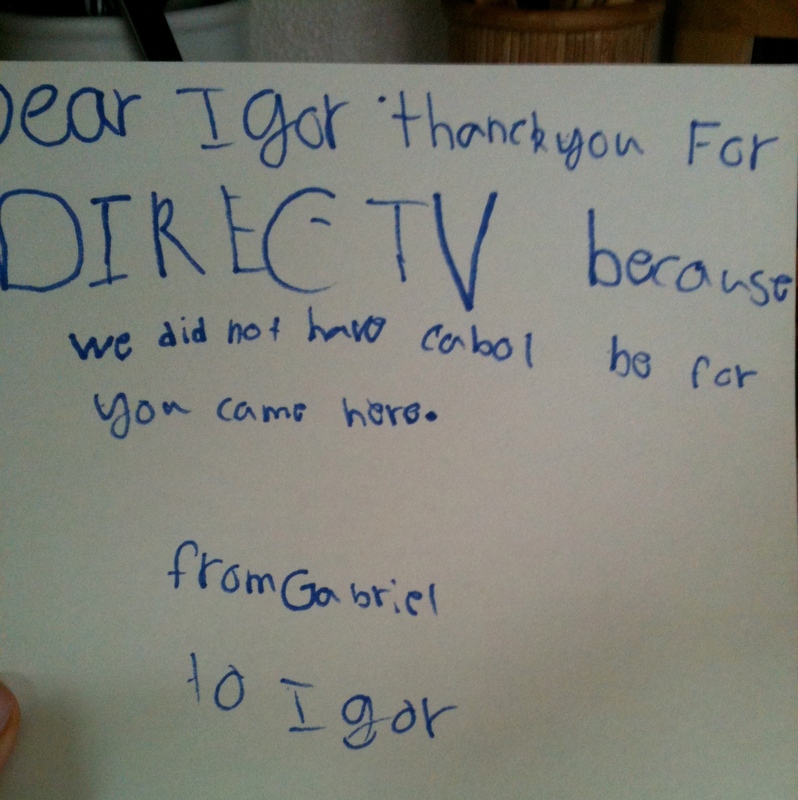 Gabriel’s mom trained him well…writing thank you notes (especially to complete strangers) is awesome! Indeed. Reminds me how sucky I am at thank you notes. Sigh. Another thing kids best me at. Oh my sweet goodness – that is awesome. Whoever this Gabriel is? I want to take him to lunch. Because that letter? Deserves a sandwich. A sandwich indeed. And *chocolate* milk. Hey that kid knows what he talking about! Those commercials are great!! I want a mini giraffe too! Thanks. Appreciate you checking out the site.